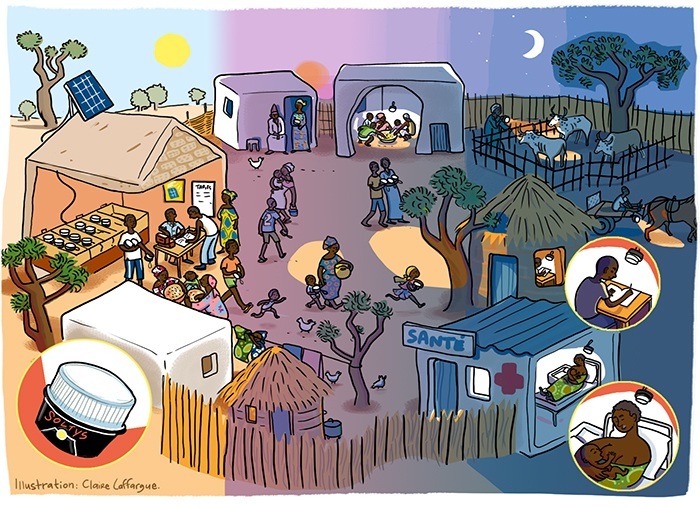 SOLTYS developed the concept of " Fountain of light ": it is a station of solar lighting for the remote villages, which allows every family to have a comfortable and reliable solar lamp, for a contribution which returns cheaper than the use of a kerosene lamp. A solution adapted to villages: the community management is usual in villages and thus applies easily to solar lamps. The level of contribution is adapted to the income of the inhabitants and substitutes itself for the purchase of oil, piles or candles. A progress for the health and the education: absence of toxic smoke, risk of burn or fire bound to kerosene lamps. Quality of lighting for homework. Continuation of the night-activities, safety of the travels. A support for the local economic development: the implementation of the fountain of light calls on to local skills: electrician (electric wiring), ironworker (support of the solar panel), manufacturer of the storage case for lamps, tailor (covers of protection of lamps). Besides, the money of the contributions generates a collective income, which guarantees the maintenance of solar lamps and allows to finance other projects.